In April, I prepared a response to a reader’s question, “Who should pay for access to OEM repair information?” for the 2018 BodyShop Business Reader’s Choice contest. The reader was wondering if collision repairers could charge for the time spent researching OEM repair procedures. In reading the numerous comments from readers that followed the article, I found a recurring theme that I believe is the very basis for why the industry has been in a conundrum for the past several decades. It’s a mentality that must change if the industry and its members hope to ever keep pace with other industries. In most states, under their individual motor vehicle repair regulations, acts, statutes, rules and/or laws, the “customer” is generally defined as the party who signs the repairer’s repair order, or authorization/contract. Therefore, it is the “customer” to whom the repairer has specific obligations and requirements that must be adhered to. And the customer has certain duties and obligations to the repairer, such as providing payment for the services rendered. There’s nothing that suggests the repairer must serve the insurer, or that the insurer owes anything to the repairer. Regardless of whether you’re a DRP, non-DRP, dealer, small mom-and-pop shop or consolidator/MSO, you provide services to “the customer,” and as such you are legally accountable to them (the one who signed the repair agreement) for the services you render and any associated liabilities that may occur. 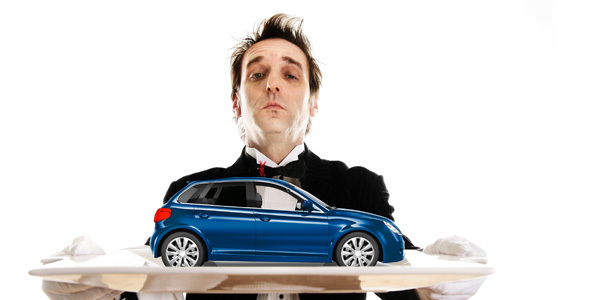 Repairers often believe they’re repairing a consumer’s vehicle but being paid by the insurer. This mentality is not only wrong but can be extremely harmful – not only to the repairer, but also to the vehicle owner and the collision repair industry at-large. Verify that the involved vehicle is the one listed on the policy (the insured vehicle). Verify the claimed damages were incurred in the covered loss (no prior or unrelated damages). In the early days, most body shops (including my father’s) were owned and/or operated by body men who set out to be their own boss. They were “body men with shops,” but few had the business acumen that is often found today. They were hard-working, honest men and women who took great pride in their work and their reputation within their community. They tried to work closely with insurance claims inspectors to earn their trust, confidence and – most of all – their referrals. 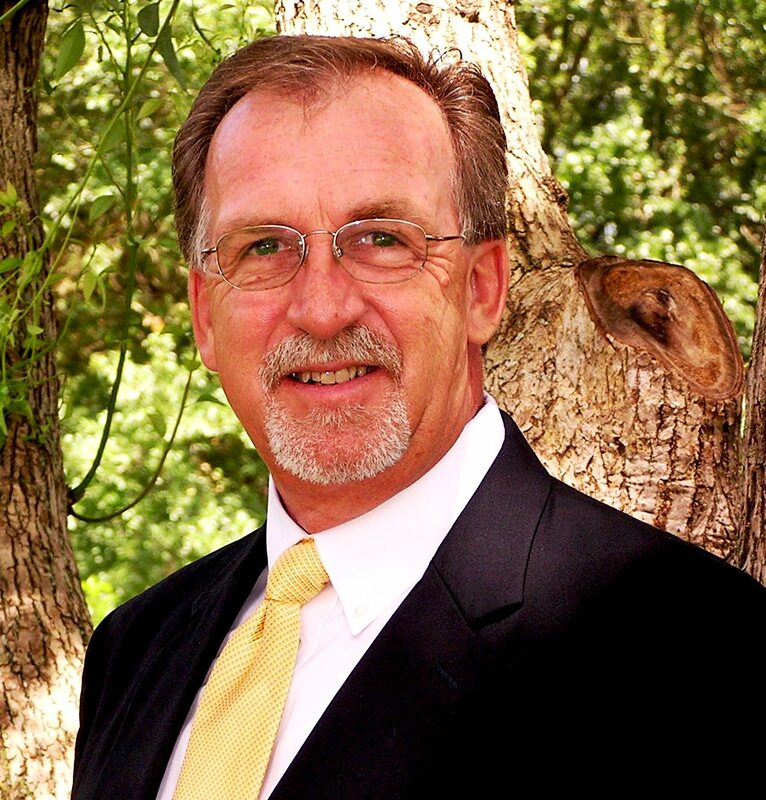 There was a good ol’ boy relationship that was beneficial to all three parties (shop, customer and insurer). Over the years, while these body men with shops remained somewhat unchanged, the insurance industry continually sought new ways to boost their profits. They recognized that the auto body repair industry was lucrative but poorly managed. With the help of industry consultants, the insurers found that the monies retained were much more profitable than premiums earned, so claims inspectors quickly became claims adjusters with marching orders to negotiate repair costs to reduce insurer payouts. Repairers, who were already relying on their relationships with the insurer representatives, were willing and eager to compete with shops down the street to garner and retain the adjusters’ favor and ongoing referrals. Because these repairers were enjoying significant profitability, they found it somewhat easy over time to succumb to the insurers’ efforts to negotiate lower pricing. The insurers’ success in reducing the repairers’ pricing encouraged additional efforts to further reduce repair costs. This included pitting one shop against another to attain aggressive discounts in labor and materials, along with an increased use of salvaged parts and, eventually, reconditioned and aftermarket parts. The advent of DRPs followed, which further divided an already fragmented industry and further lowered pricing – pricing that is now often referred to as “prevailing competitive pricing,” or PCP. Then came consolidators and MSOs, who found they could reduce the cost of operation and offer lower pricing through economies of scale (quantity pricing) and practices. This enabled them to offer further discounts and concessions through standardized processes that offered insurers additional claims-cost savings such as reduction in administration personnel (i.e. salaries, benefits, car, office, etc. ), rental fees, etc. 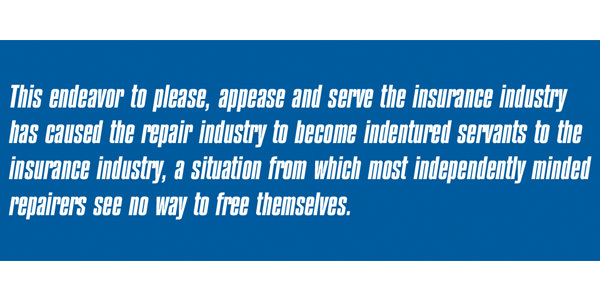 This endeavor to please, appease and serve the insurance industry has caused the repair industry to become indentured servants to the insurance industry, a situation from which most independently minded repairers see no way to free themselves. So here we are today with the same inappropriate mindset that body shops work for insurers. While many insurers do their utmost to maintain this way of thinking to maintain control, it is a fallacy that could get a repairer into serious trouble and trapped in this flawed, illogical and dubious way of thinking. All one has to do is look at the recent John Eagle debacle, where the repairer was held totally accountable for their actions regardless of how the insurer may have written for the repair to be performed. The old “The devil made me do it” defense is no more effective today than it was when first used. Knowing how we got here, you may now wonder what the alternative is. How do we break free of the “ties that bind” and change the industry’s misguided way of thinking? We begin by understanding the laws that govern your business within your state and begin to adopt and adhere to them. Next, you step back and look through a neutral lens at how you currently conduct business. What are you doing wrong, and what steps need to be taken to correct it? Once you accept the fact that you work for the customer and not the insurer, you can begin to cater to those you do work for and place the insurers in their proper role. In next month’s “Ask The Expert” column, I’ll explain how a truly quality-minded independent repairer should view their relationship with those they interact with on a daily basis, including insurers and their staff.